The coast of the Gulf of Porto is one of Corsica's most famous landscapes, and rightly so - with its dramatic sculpted red rock and sweeping bays it has to be seen to be believed. The pinnacles and ravines of the red granite Calanches soar out of beautiful blue seas framed by the jagged peaks of Paglia Orba. They are best explored by foot or by boat. There are daily boat trips from Porto that visit this UNESCO world heritage site. Porto is tucked away at the end of the gulf, and although deprived of the best views across the bay, it is well placed for exploring and has plenty of amenities. The Route de la Marine, lined with stately old eucalyptus trees, links the two parts of the resort. A strip of supermarkets, cafés and hotels is at one end of the village but the focus of activity is in the marina. From here it is about a 15-minute walk up to the recently restored Geonese watchtower. Amongst other amenities there is a well established aquarium and a helpful tourist office. Piana is balanced on plunging cliffs and despite its prime location overlooking the Calanches, it retains its sleepy feel and does not suffer the crowds of tourists. It comprises a cluster of old stone houses arranged around an 18th century church and square, from the edge of which the views over the gulf are sublime. Stacked slabs, towering pinnacles and gnarled, claw-like outcrops of rock were formed by volcanic eruptions 250 million years ago and a subsequent erosion has fashioned spectacular shapes in the rock. The colours are remarkable and vary from charcoal grey to incandescent reds and rusty purples which strike a vivid contrast with the deep green maquis and the cobalt blue sea. The headland and its surrounding waters were declared a nature reserve in 1975, so wildlife is as varied here as anywhere in Corsica. Dolphins and seals thrive, and colonies of giant gulls and cormorants inhabit the cliffs. Ospreys are found here, their huge nests visible from the sea and there are regular sightings of Peregrine falcons. Rare indigenous plants grow freely, but as the entire reserve is off limits to hikers, flora spotters are deprived the chance to further investigate. Find out more about Scandola Nature Reserve. 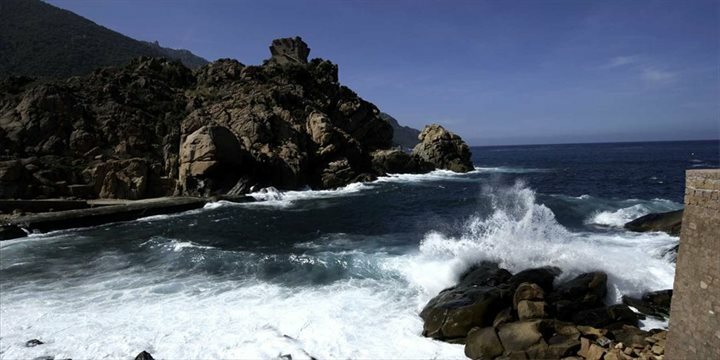 The coast of the Gulf of Porto is one of Corsica's most spectacular landscapes. Set off on a marked trail and discover the exceptional wilderness along the coast and the corroded beauty of the red cliffs. Alternatively, take a boat trip to the Calanches. There are daily boat trips with the Columbo line from Porto that visit this UNESCO world heritage site. Stacked slabs, towering pinnacles and gnarled, claw-like outcrops of rock were formed by volcanic eruptions at Scandola 250 million years ago and a subsequent erosion has fashioned spectacular shapes in the rock. The colours are remarkable and vary from charcoal grey to incandescent reds and rusty purples which strike a vivid contrast with the deep green maquis and the cobalt blue sea. The headland and its surrounding waters were declared a nature reserve in 1975, so wildlife is as varied here as anywhere in Corsica. Visit the isolated village of Girolata set against red granite cliffs on the north west coast, only reachable by boat or on foot. Heading east towards Corte through the Deux-Sorru and Deux-Sevi regions of the island, presents a rather challenging, but definitely rewarding, drive, along the D84 through Calacuccia. The remoteness of this area of the island has helped preserve some of the rarest forms of wildlife, including wild boar, eagles, red kite, the Corsican nuthatch and the, rarely seen, Corsican savage cat, the Gjhattu Volpe. There are several walks marked from the road and numerous rock pools for bathing (look out for the signs for piscine naturelle). There is an excellent walk to the Lac di Ninu at the foot of Monte Tozzu and the Cascade Radule. The road passes through the Forêt d'Aitone, in which there are thousands of Laricio Pines, some over 50m tall and over the Col de Vergio and through the Laricio Pine forest of the Valdo-Niellu.The stretch to Corté then follows the route of the 19th century road that clings to the side of the vertiginous ravine of the Golo River. Cargèse is at the northernmost tip of the bay and is a charming cliff top village with an unusual history and ancestry linked to the Greek Peloponnese. Even today there are both Catholic and Greek Orthodox churches although both are presided over by the same minister. The whole Gulf of Sagone (Corsica's largest gulf) is characterised by long curves of sandy beaches stretching 40km from Capo di Feno up to the Punto di Cargese. Sagone is further south and thrives as a water sports centre whilst Tiuccia is tucked into the Gulf of Liscia at the easternmost indent and has a trio of minor historic sights. Two 17th century Genoese watchtowers and the other, the ruined Castellu di Capraja. It is the most sheltered spot and has a fine golden beach.